Because of its ease of cultivation and nice flowers, the Adenium obesum was propagated and grown as general ornamental plant all over Asia, notably in Thailand. Until in around 10 years ago, other cultivars of adenium was brought to Thailand. Then selecting and hybridizing of Adenium started. Until now many hybrids have been produced by many breeders. The flower color and form of new hybrids are much more beautiful than original adenium. Flowering habit is also improved, many new hybrid flowers in large group of flowers and flowers all year around. There are many nice hybrid that are worth cultivating. 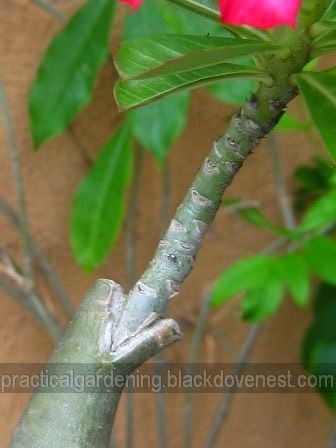 The Wedge style of grafting entails cutting a V-shaped groove into the top cut of the Adenium obesum stock. This is the groove unto which the v-shaped end of the Adenium scion will be inserted. After cutting and inserting the scion to fit nicely into the groove of the Adenium stock, a wrapping plastic film with elasticity similar to cling wrap is wound on both the Adenium stock and scion. Will work on thick branches. The thick branches of the Adenium obesum allows you to cut and carve a v-cut. Less likely to dislodge. The nature of the v-cut graft is that a "key" (scion) is wedged into a "groove" (stock). This matching allows the scion to rest safely into the stock with minimal sliding or tipping. More surface area in contact. The v-cut essentially allows a bigger surface area for contact between Adenium scion and stock than you would otherwise get when using a simple flat-cut (at least in theory). Shown below is the v-cut or wedge graft made on both Adenium scion and Adenium stock. As I have discovered, getting the desired v-shape on both Adenium scion and stock can be a bit tricky if the two shapes don't match. If the groove on the Adenium stock is too deep or too pointed, you risk splitting the top of the stock especially if it is soft. If the groove on the Adenium stock is too wide or if the Adenium scion is too pointy, then a gap may exist and there will be no full surface contact between the Adenium scion and stock. The proper method therefore is to make the cuts as compatible as possible and this may entail redoing the cuts on both Adenium scion and stock several times. In my v-cut graft as shown above, notice that the Adenium stack branch is much thicker than the Adenium scion. I chose this thicker branch to allow me to work on the cuts without breaking, or cutting by mistake, parts of the Adenium stock. 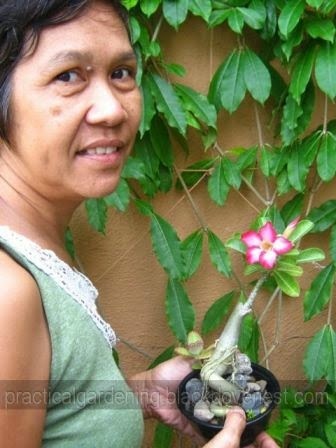 Shown below is a successful wedge grafted Adenium obesum or Desert Rose plant. UPDATE: I tried a flat-cut grafting technique and it's easier to do for Adeniums.